Plant Based is a monthly magazine that inspires everyone to go meat and dairy free every day of the week. Whether you are changing your diet for health, environmental or financial reasons, then this is the magazine for you. Buy a single copy or subscription to Plant Based magazine. 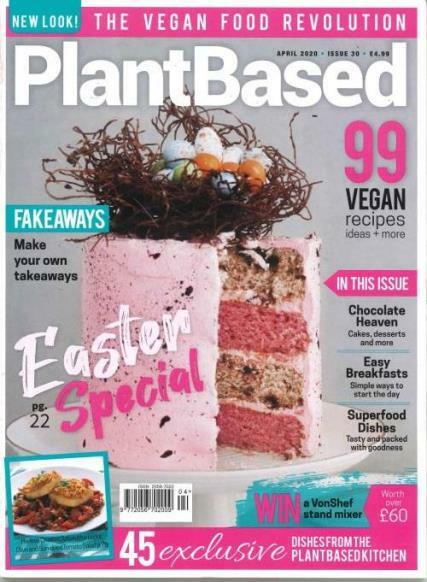 Plant Based Magazine shows just how easy it is to make everyday meals, special treats and dinner party successes. Seasoned vegans and newbies will all welcome the chance to become a more confident and proficient cook with the exciting recipes contain within this magazine and the nutritional information that is provided.